This is a pulse-pounding, high-tension, timed game of saving lives � and you probably won�t be able to save them all. The FREE companion app timer limits player turns to 60 seconds and later dwindles to just 45 or 30 seconds as players race to triage new patients, purchase medical supplies, treat their medical needs and transport them to the hospital for victory points. Critical patients add to the drama, as they must be treated and sent to the hospital immediately or they head to the morgue instead� counting against your score. 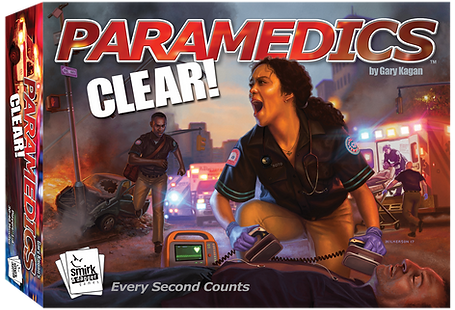 Paramedics: CLEAR! is an intense, competitive game for 1-4 players and will appeal to gamers who enjoy fast-paced, timed games. While not strictly the backstabby game Smirk & Dagger is known for, experienced players will find opportunities to turn up the heat on their opponents as they manage the clock more expertly.